Almost everyone we've ever invited over for lunch would have tried Mr G's Hainanese chicken rice, at least once. Mr G being Mr TFWL, but I'll save on the keystrokes. In fact, we serve it so often that people have come to expect it from Mr and Mrs G's House of Chicken Rice. Okay, so there are a couple of reasons why it has become a staple on our "menu". Firstly, everyone eats chicken (unless you're vegetarian of course, which means you'd best be eating rice with cucumbers) and I think the neutral flavours agree with the general palate. I can't think of anyone who doesn't like chicken rice. Secondly, it's pretty much a one dish meal served with rice, and perhaps accompanied by a side dish of stir-fried vegetables, which makes preparation a breeze. Coincidentally (ahem...), it also suits my personal agenda, as it means that Mr G does all the cooking while I sit back and relax. No, of course not. There are still appetizers and dessert to think about. But this post is not about chicken rice. It's not easy to please everyone when it comes to food, and I usually try to avoid the common food aversions, like lamb for example. Lamb is like the national meat of Australia. I love lamb. In Malaysian cuisine, you'll find that mutton is often used instead of lamb. Mutton is also known as goat, or the meat that comes from older sheep. It has a stronger taste and smell compared to lamb that people may find offensive, and the meat tends to be very tough. Because of this, I prefer my mutton to be slow-cooked in rich spices to cloak the strong gamey taste, and if done well, it can taste quite exotic and delicious. Mutton curry and mutton soup (Malaysian "Sup Kambing") are some of my favourites. On the other hand, lamb is quite different and does not have the overpowering taste of mutton. I digress. I suggested to Mr G that he got some of his friends together for a wine pairing lunch with a Thai-inspired menu. As I had never met them before, there were no expectations about their food preferences. Therefore, I had no qualms about putting lamb on the menu, although I prepared a contingency dish of Thai barbecue chicken ("Gai Yang") just in case. We seldom have wine with Asian dishes as the highlight of the meal is always the food, not the wine. It can be tricky when choosing the right wine to match especially when the dishes are spicy, which tend to kill the flavours of the wine you're drinking. Wines that are high in alcohol, tannin and oak are best avoided when eating spicy food. A glass (or two) of ice-cold water is probably the first thing I would reach out for. For starters, we served fresh Sydney rock oysters with a Thai-style dressing made with lime juice, palm sugar, chilli, fish sauce, ginger, lemongrass and scallions. I held back on the chilli as I didn't want it to overpower the Prosecco, an Italian sparkling wine made from Prosecco grapes. As oysters are naturally salty, a high acid wine (also Champagne, Riesling or Semillon) helps to temper the saltiness as well as stimulate the salivary glands. That probably explains why sparkling wine is usually served at the start of the meal to whet the appetite. The fish mousse (or as we call it in Malaysia, "Otak-otak")﻿﻿﻿﻿﻿﻿ was actually quite spicy. It's made with fish, red curry paste, coconut cream and eggs, and then steamed over banana leaves. I was afraid that the chilli might clash with the Pinot Gris, which was a light and crisp white wine with a musky pear aroma. Surprisingly, both paired really well, as the Pinot Gris has no oak nor tannins and delivered a nice smooth finish that complemented the silky texture of the fish mousse. Next, we opened the bottle of Yarra Valley Pinot Noir, described as being full-flavoured with ripe plum, cherry and spice characters. Some of us begged to differ and found the wine to be relatively light and medium-bodied, with a light berry colour that was reminiscent of Ribena (as in the blackcurrant drink). Nevertheless, we gave it a unanimous thumbs-up that it was a perfect match with the Thai-style duck salad. Remember, if you're having duck, you can't go wrong with a Pinot Noir! As we got to our fourth and final bottle of wine, some of us started feeling a little too happy and the volume level at the dining table started to elevate by fractions of a decibel with each sip of wine. But really, four bottles of wine (which we didn't finish) were quite reasonable considering there were seven of us, enjoying a slow and long lunch with good company, good food (ahem...) and a wonderful selection of wines. 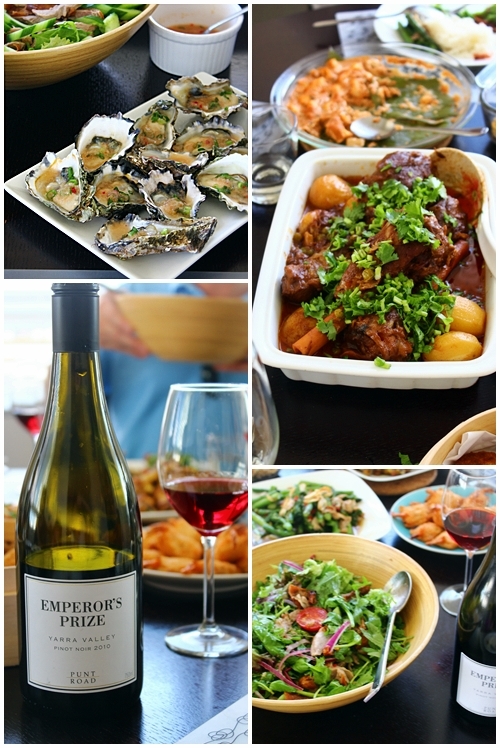 We had the lamb shanks with our final bottle, a Grenache, which was more full-bodied and earthy with a long finish. It was an excellent pairing with the Massaman lamb, which was mildly flavoured and with hints of sweetness from the palm sugar. I think the fact that the lamb was quite subtle in taste (after hours of slow-cooking which probably infused it with all the spices) made it "palatable" even to those who didn't usually eat lamb. For the recipe, please click here. We ended our meal on a sweet note with honeydew sago, made with honeydew, sago, coconut milk and sugar syrup. After a busy morning in the kitchen, I figured this would be an easy one to prepare. The sweet and ripe cubes of honeydew immersed in cold sweet coconut milk, interspersed with little sago pearls, made for a delightful bowl of dessert which was light and refreshing. At the thought of coconut, Malibu rum sprang to mind and I brought out the bottle should anyone decide to continue with the booze fest we were indulging in that afternoon. It's no surprise that a splash of Malibu worked really well with this dessert, much like an essence of coconut with an alcohol hit. Adults only, please. And in case you were wondering, no kids were intoxicated in the making of this lunch.